Once settled in Bigfork, Mont., the pair hiked daily in the forests around their home. Grabelle once calculated that they had walked or hiked over 10,000 miles together over the years. More than her hiking partner, Sugar is the subject of many of Grabelle’s photographs, a co-creator of Grabelle’s artistic expression. So when Sugar’s back legs became paralyzed in the fall of 2015, Grabelle documented that odyssey too, which ultimately led them to the Washington State University Veterinary Teaching Hospital and Sugar’s full recovery. A paralyzed Sugar in a Pullman motel the morning of her appointment at the WSU Veterinary Teaching Hospital. Photo by Lauren Grabelle. An exhibit of Grabelle’s work, called “Sugar Rising,” opens on Thursday, Sept. 7, at the WSU Animal Health Library and runs through January, part of the WSU “Art in the Library” program. An opening reception is planned from 4-6 p.m. Thursday, Sept. 7, in the veterinary medicine Animal Health Library, Wegner Hall 170. The twice-yearly “Art in the Library” exhibit features animal-themed works, typically from artists with a connection to the WSU College of Veterinary Medicine. For more information, visit http://www.vetmed.wsu.edu/news/art. Grabelle purchased Sugar from a Weimaraner breeder in 2005. 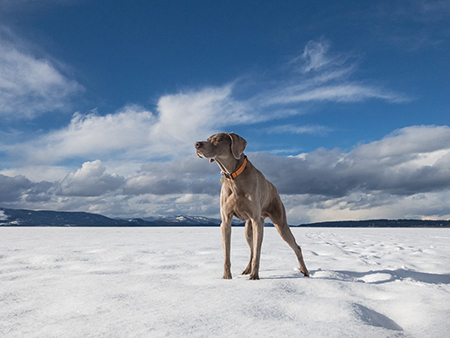 Montana photographer Lauren Grabelle and her 12 ½ year old Weimaraner, Sugar. Photo by Lauren Grabelle. From the moment Sugar arrived, Grabelle loved photographing the puppy. She entered photos of Sugar in a contest judged by William Wegman, the photographer who famously included his own Weimaraners in his whimsical images. Grabelle’s photos earned first and third place. “The very first time I took photos of Sugar, it became a form of art,” Grabelle said. 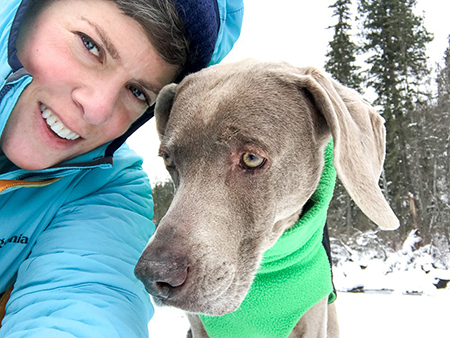 In 2010, Grabelle moved to Bigfork on Montana’s Flathead Lake, the polar opposite of New Jersey’s hustle and bustle, to give Sugar more freedom and space to run. On daily explorations behind their home, Grabelle said “the relationship with Sugar and photography deepened. Grabelle and Sugar continued their daily active lifestyle in Montana for five years until Sugar started to avoid hiking down the trails they used to walk on regularly. She also couldn’t bend her neck down to eat food from her bowl. A local vet diagnosed her with a form of arthritis common for aging dogs and prescribed medication. But Sugar’s stiffness and pain persisted, until the day she couldn’t move her back legs. A recovered Sugar celebrates another winter on Flathead Lake in Montana. Photo by Lauren Grabelle. For two weeks, Grabelle carried Sugar everywhere, bought diapers for her, took Sugar to more vet appointments and had more X-rays taken to try and determine a cause for Sugar’s paralysis. One veterinarian suggested taking Sugar to the WSU Veterinary Teaching Hospital, six hours away. They managed to get a neurology appointment the day after Grabelle called the hospital. Instead of another X-ray, WSU neurology intern Dr. Tom Jukier ordered an MRI, “the best test for spinal cord conditions,” he said. The test revealed not arthritis, but a bacterial infection of the spinal discs. Two days after starting antibiotics, Sugar was standing again. Today, Sugar walks with Grabelle on the trails again. 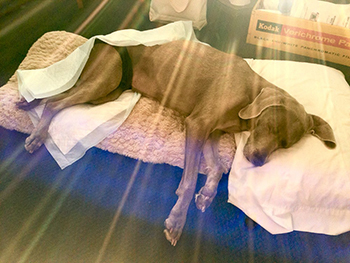 And while the Weimaraner is slowing down with age, she’s still Grabelle’s muse. NOTE: For another article about Sugar, go to http://giving.vetmed.wsu.edu/giving-opportunities/mri-campaign/the-need/patient-stories. To see Grabelle’s photographic work, go to http://www.laurengrabelle.com.